1. Mix together the soy sauce, 1 tbsp sesame oil and the seeds, garlic, pepper and chilli paste. Stir in the prawns and marinate for 10-20 minutes. 2. Heat the remaining oil, and fry the carrot and onions for 2-3 minutes. Stir in the prawns and marinade, and cook for 2 minutes. 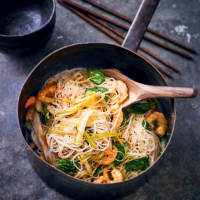 Add the beansprouts, Chinese leaf and spinach, and cook for 1-2 minutes until wilted, and ensure the prawns are cooked through. 3. Pour boiling water over the noodles, then drain and fold into the stir-fry, and serve. This recipe was first published in Thu Sep 22 12:36:00 BST 2016.